Dunipace v Bonnyrigg Rose. Penalty 3rd goal celebrations. 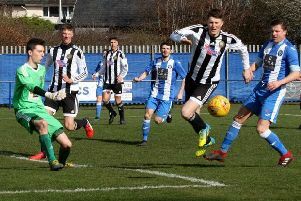 In front of an impressive crowd of 380 at Westfield Park thanks to the innovative GroundHop UK event, the Rose easily swept aside the opposition – a team they had previously beaten 6-0 earlier in the season. They opened the scoring after only six minutes as Ross Gray assisted Aaron Murrell who fired home the opener. The Rose struggled to break down Dunipace’s resistance but three goals in the second half ensured there would be some gloss on the scoreline. After Dean Hoskins had hit the post with a header early in the second half, they eventually doubled their lead on the hour mark as Lee Currie engineered space, dummying his man before unleashing a low drive. Soon afterwards boss Robbie Horn rang the changes with Neil Martyniuk, Jon Brown and Keith Lough all being introduced. Martynuik was denied by David Kane before Currie also went close. However, the Rose would not have to wait too much longer for the third. The Rose were awarded a spotkick for an apparent infringement in the box, up stepped Currie who dinked a “panenka” style penalty down the middle with Kane diving to his right. The Rose grabbed their fourth, and 90th of the league season, with three minutes remaining as substitutes Lough and Brown combined, with the former powering a header beyond Kane after an accurate delivery from Brown. 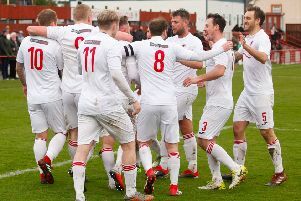 Rose have yet to find out whom they will face in the play-offs, but it could be either local rivals Penicuik or Hill of Beath from Conference A or Broxburn or Linlithgow Rose in Conference C.
Up next for Horn’s side is a South Region Challenge Cup semi-final encounter with Stirling Uni on Saturday. Rose: B.Young, Brett, Brown, Horne, K.Young, Hoskins, Gray, Swanson, Murrell, Nelson, Currie. Subs: Martyniuk, Stewart, Lough, Turner, keeper Andrews.